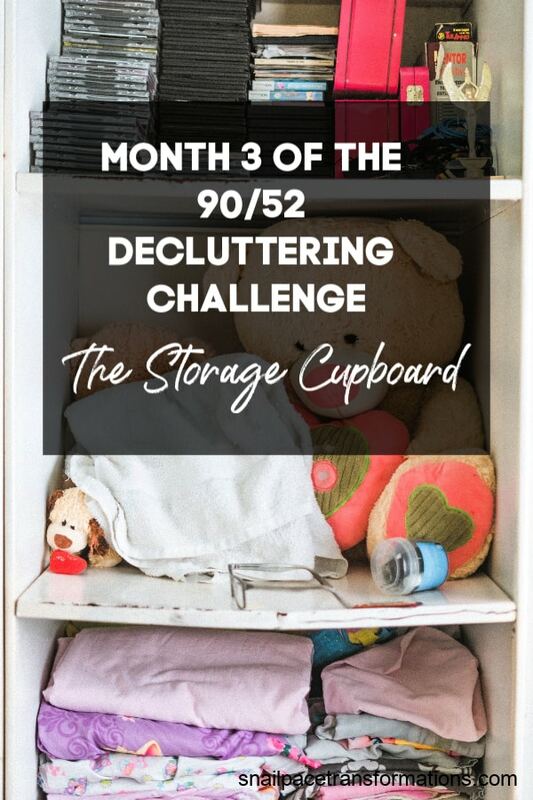 The 90/52 decluttering challenge involves decluttering for 90 minutes every week for one year. 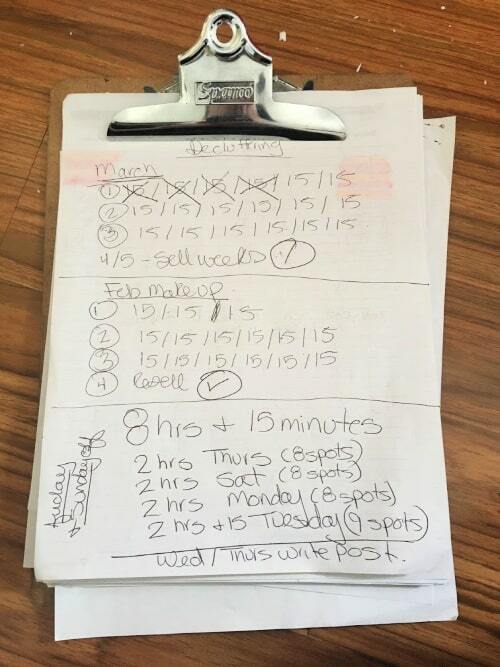 Today I am showing you what I got decluttered during month three of this challenge. As I confessed last month, I have fallen behind in the 90/52 challenge. 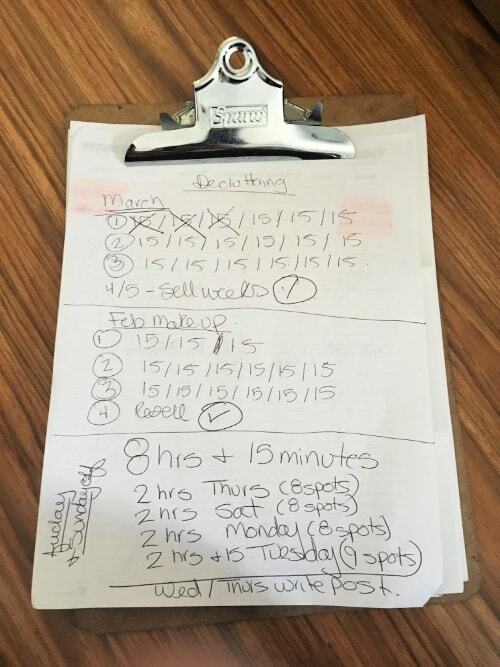 As you will see on the handwritten chart below, I had a plan to catch up in March, but life got in the way. I am still holding a positive attitude in that I think I will catch up over time and end the year with every minute of the 90/52 challenge done. 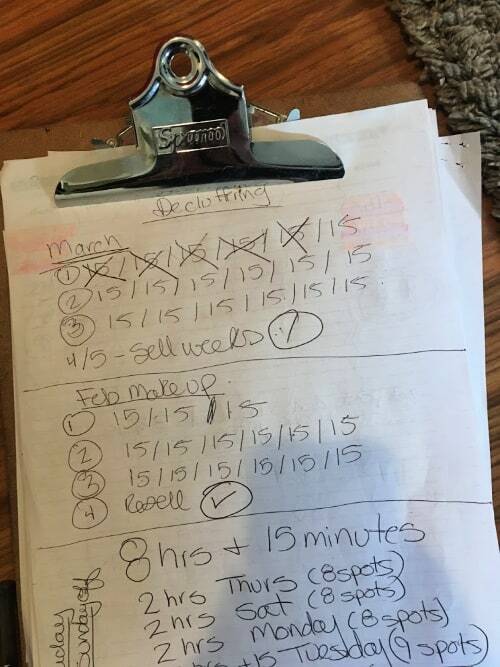 It has been over two years since my last full house decluttering challenge and during that one I didn’t get to the tough stuff like paperwork and sentimental items. 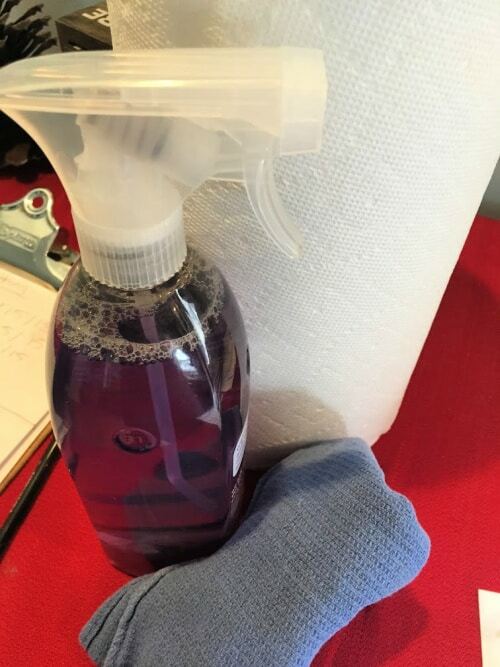 With this challenge, I want to change that and finish the year with a completely decluttered home from attic to basement. 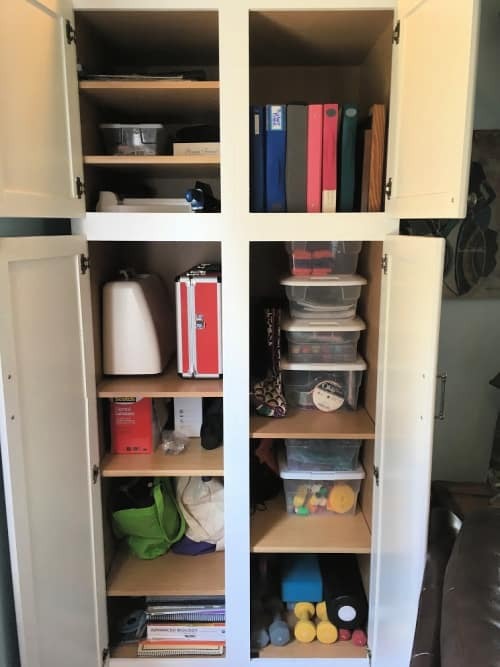 With my favorite decluttering tools out and ready to use when I needed them, I set out with big plans to declutter our family room. I decided to declutter the big storage cabinet in this room first. In the end, it was the only area in the room that got decluttered. I had no idea there was going to be so much paper to go through in this cabinet. 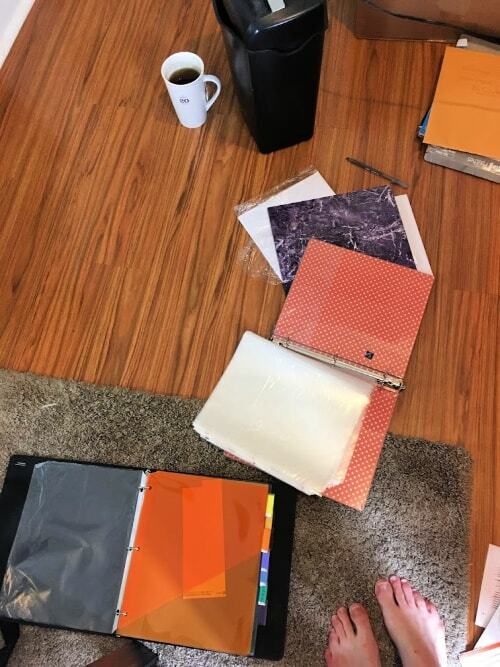 After my first 15 minute session was done, I had gone through several binders and found several more that I needed to go through. I struggled with the urge to just stack these up neatly in the cabinet, leaving their contents untouched. 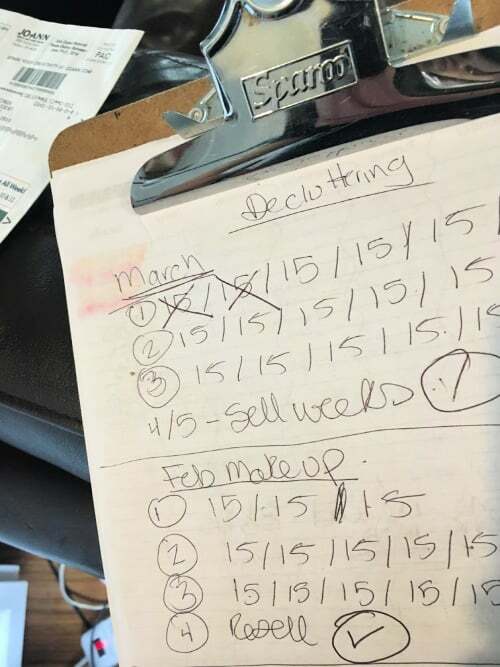 However, as I said earlier in this article, my goal with this 90/52 challenge is to deal with the hard stuff that I left untouched during my last full year decluttering challenge. 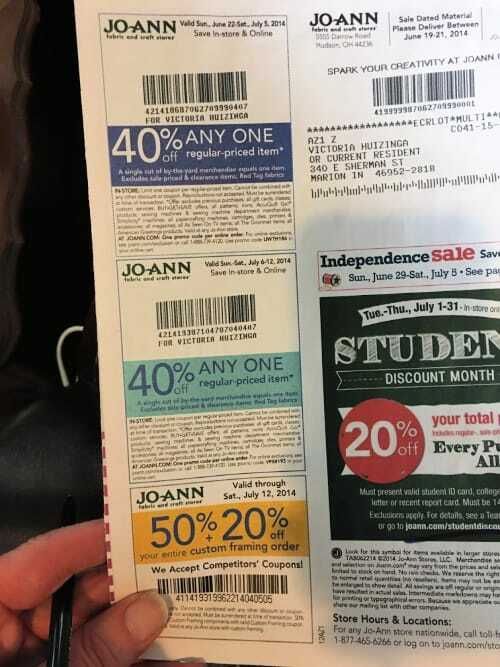 During the second session, I found a bunch of flyers, including this one from 2014. Yikes! 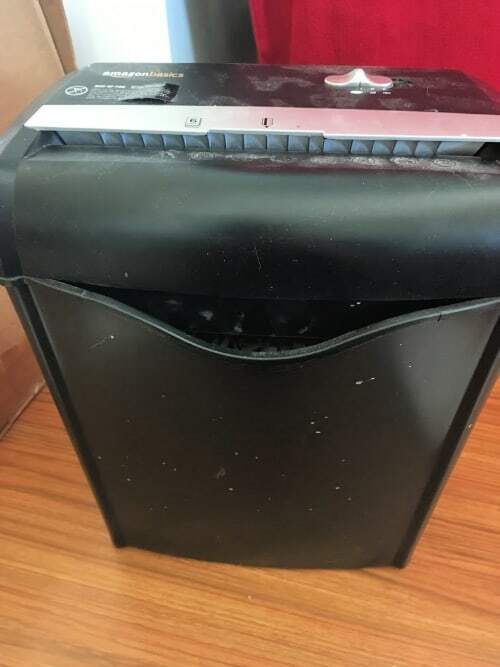 By the end of the third session, I was reminded of how much I like my paper shredder. I purchased it from Amazon back in 2015 and it is still going strong. I am very impressed with its durability. 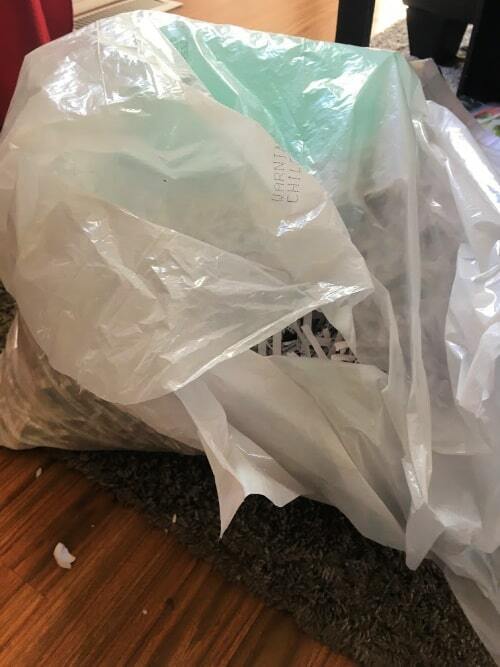 After the 4th decluttering session, my garbage bag was already over half full of shredded paper–yet the cabinet looked untouched. 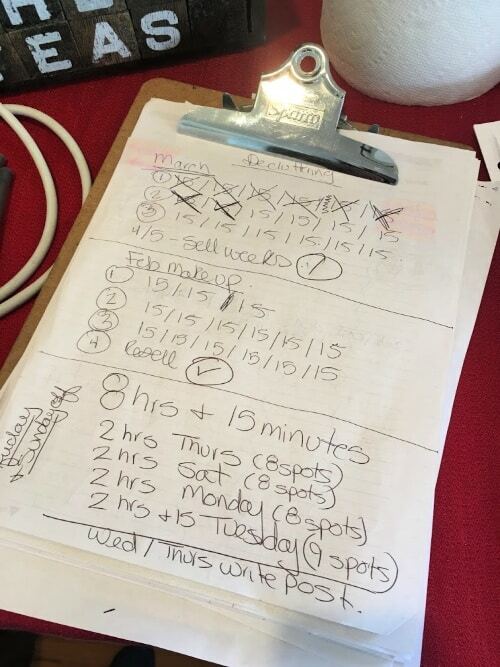 During session 5 I gave the shredder a break sorted through and reorganized the items that were left in the cabinet. I didn’t find much to give away, sell or toss. Most of the work I ended up doing decluttering this storage cabinet involved going through numerous binders full of random paper items. 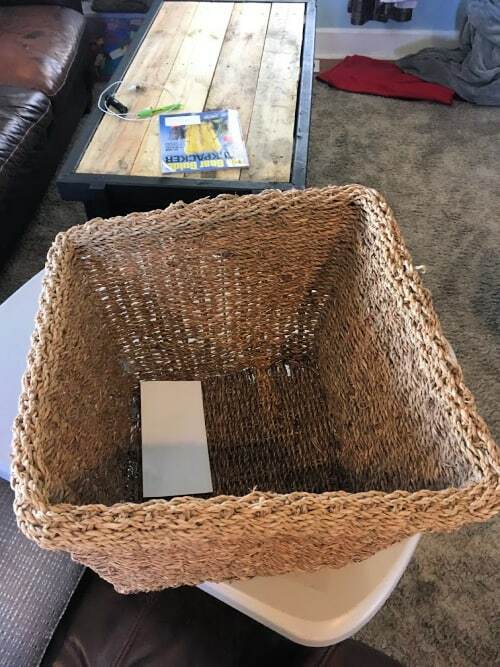 I forgot to take pictures of the sixth session, but during it and session number seven I went through more paperwork and then emptied this basket which was full of homeschooling paperwork I need to keep for records into the back of the cabinet. Now this basket empty–and it may just stay that way. 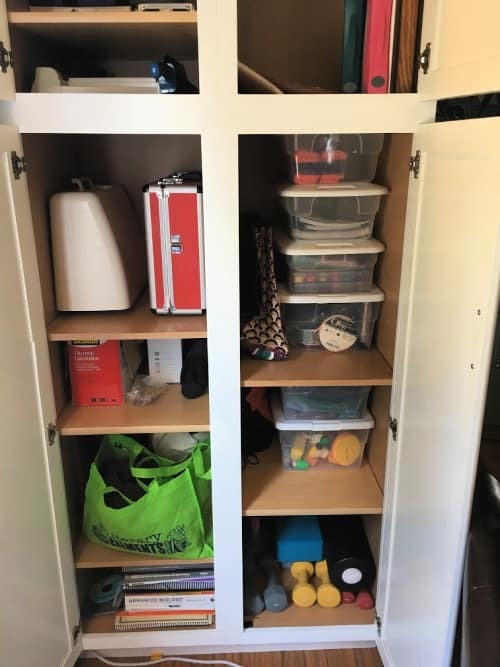 Session number 8 ended up being the last session of decluttering I was able to do before writing this post update. 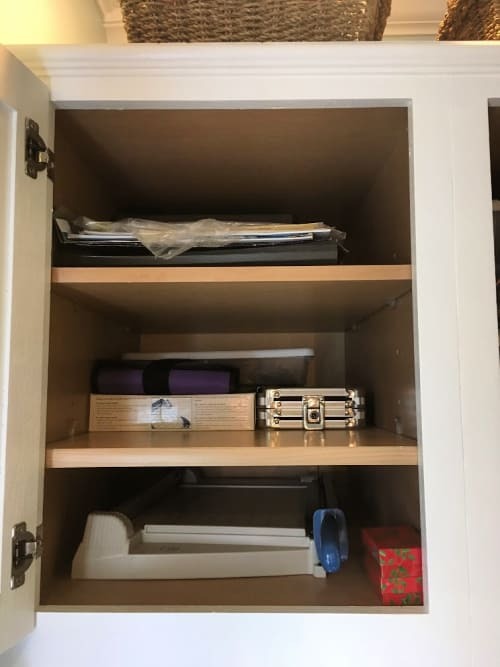 During it, I finished organizing the storage cabinet. I am pleased with how it looks. 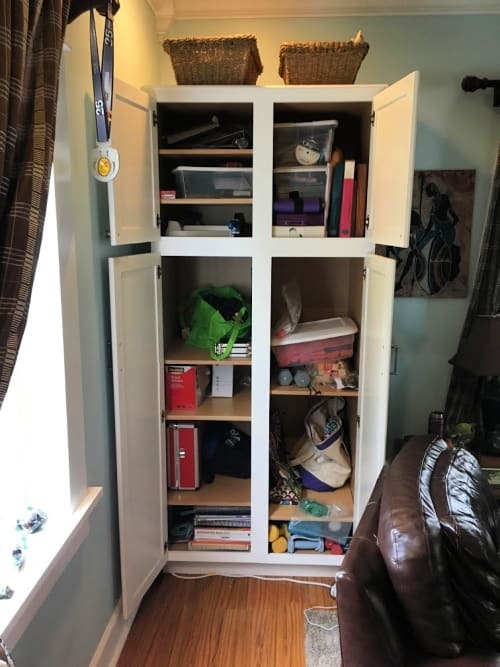 At one time this cabinet was so stuffed the doors barely shut –now there is lots of open space, making it easy to get items in and out. As you can see, I didn’t find much in the cabinet for the donation box -just a file folder and some gift boxes. Hopefully by the end of April I will have this box full and off to the thrift store. 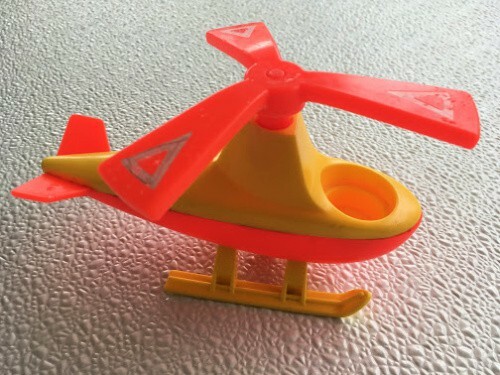 I sold this vintage Fisher-Price toy helicopter on eBay this month. 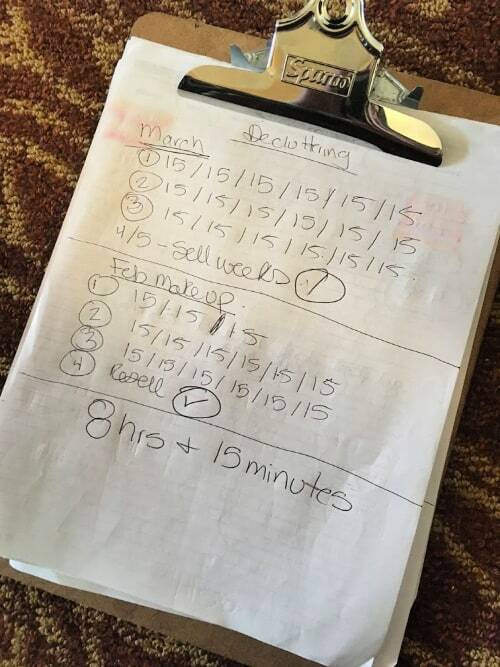 One week each month I spend the 90 minutes of 90/52 reselling items. 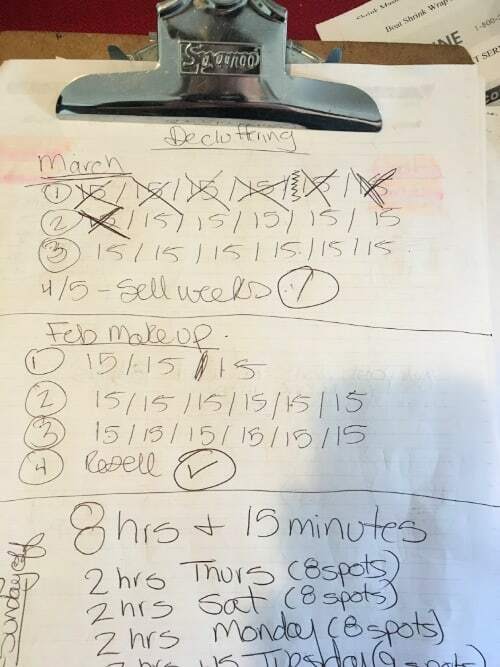 I am spending much more time than that each month, but I only allow it to count as one week of 90/52 as I would never get the whole house decluttered if I did. 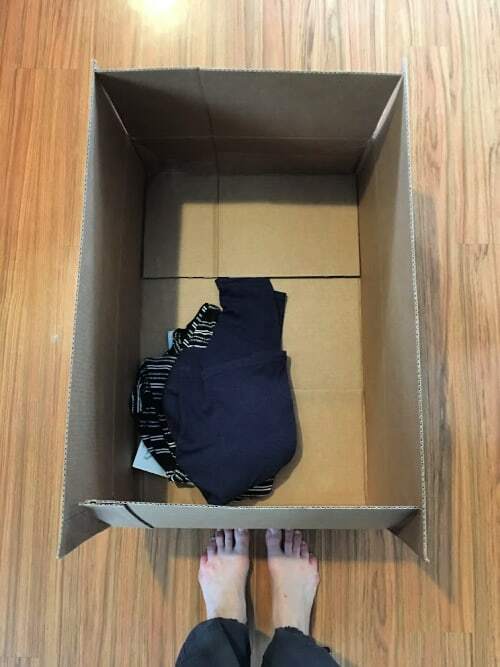 I tend to spend around 1 to 2 hours every weekend listing items on eBay, and then there is time to wrap it and ship it when items sell. This month I pocketed just over $115 with a few days in the month still left for items to sell. That brings my total for the year to $530. 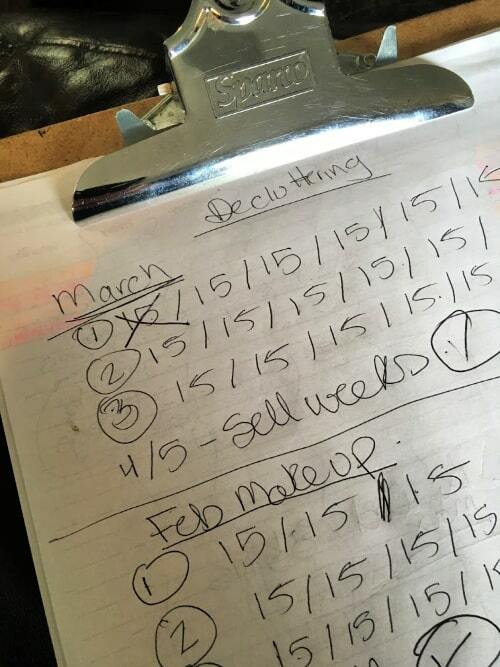 With three months of the year gone that means I am earning an average of $175 a month selling our clutter. I am pretty happy about that. But you know what I am even happier about? 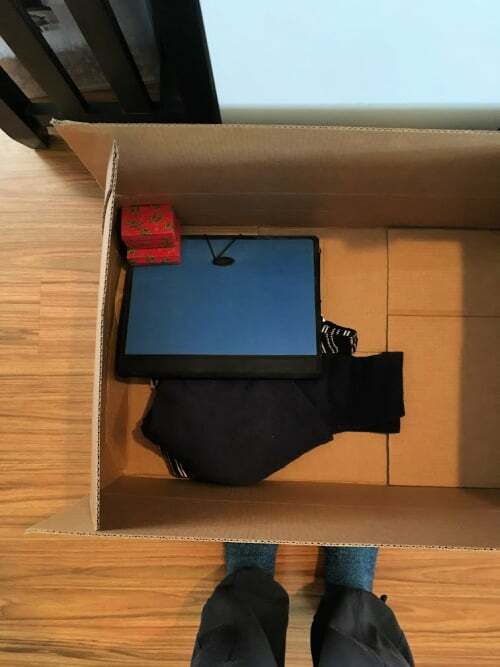 The empty space in my home that I gain each time an item gets shipped to its new owner. I am doing my best to track every bag of garbage, every box donated and every item sold so that I can total them up at the end of the year and hopefully be pretty proud of the totals. It isn’t too late to join the challenge. 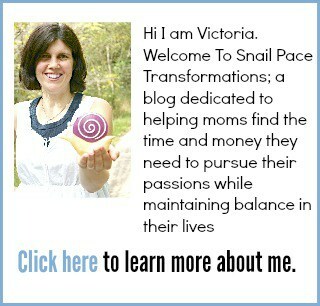 Join us in the Snail Pace Decluttering Facebook group and be supported in your decluttering journey. These courses are inexpensive, practical, and can make a HUGE impact on how much you can get done in a day when you apply what you learn. When I took them, I gained an hour and a half each day! 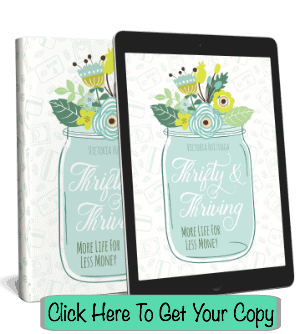 No money to spend? 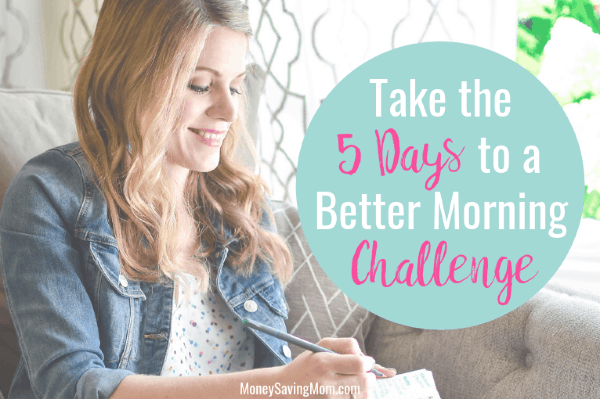 Crystal offers a FREE 5 day Make Over Your Morning Challenge that is full of what you need to get started in living your days with less chaos.